Nearly 5,000 Anteaters filled the right-field seats at Angel Stadium of Anaheim on Saturday, May 9, wearing blue-and-gold, limited-edition baseball caps for “UCI Night with the Angels.” The last time so many members of ‘Eater Nation congregated at the stadium, it was to hear President Barack Obama speak to the graduating class of 2014, an event that kicked off UCI’s 50th anniversary celebrations. Proud students, faculty, staff, alumni and friends visited the UCI Village for giveaways and photo opportunities with Peter the Anteater before the game against the Houston Astros. 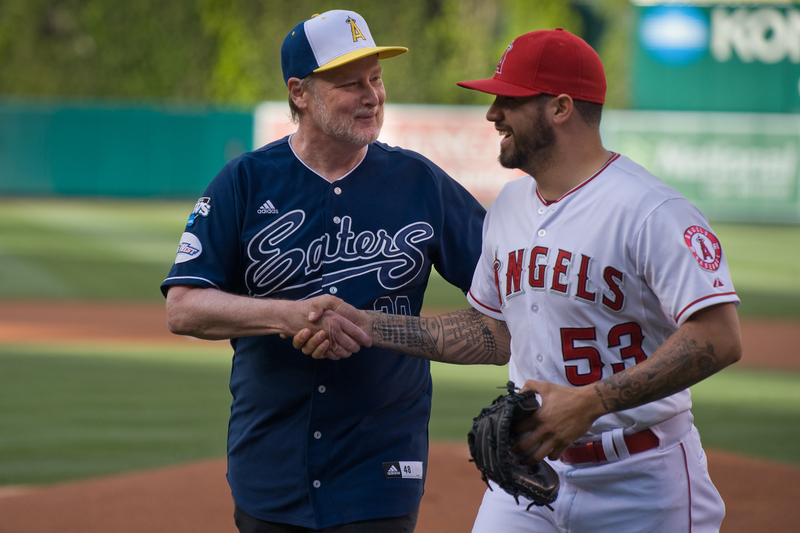 Chancellor Howard Gillman, wearing a blue UCI baseball jersey, took the mound to throw out the first pitch of the night. Peter the Anteater, recently named Mashable’s Mascot Madness champion, had the honor of placing the official game ball on the pitcher’s mound before the players took the field for the first inning.